Looking at Paintings: A Guide to Technical Terms / eds. Tiarna Doherty and Anne T Woollett. Los Angeles: J. Paul Getty Museum, 2009. Dommermuth, Jean. 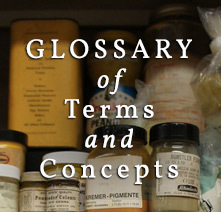 Glossary for Principles of Conservation course, Conservation Center, Institute of Fine Arts, New York University, 2012. Nicolaus, Knut. The Restoration of Paintings. Cologne: Könemann, 1998. Skaug, Erling. Punch Marks from Giotto to Fra Agelico: Attribution, Chronology, and Workshop Relationships in Tuscan Panel Painting: with Particular Consideration to Florence, c.1330-1430. Oslo: IIC, Nordic Group, the Norwegian section, 1994.